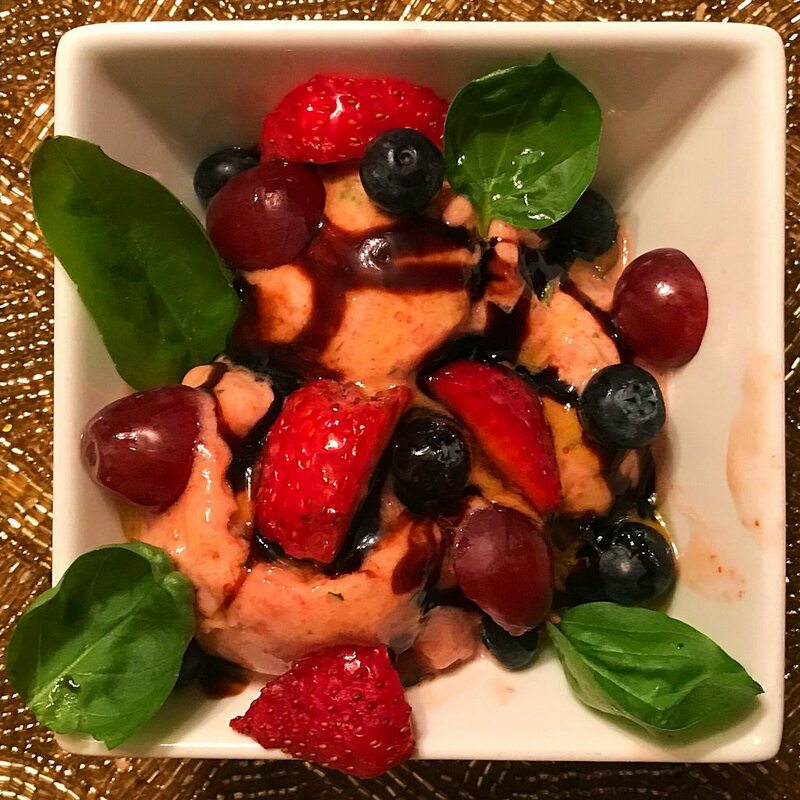 Mrs. P made strawberry sorbet with lemon, homegrown basil, sugar, topped with fresh blueberry, strawberry, and grape garnish, and drizzled with reduced balsamic and olive oil The balsamic was simmered until it was a thick syrup. She really outdid herself this time. 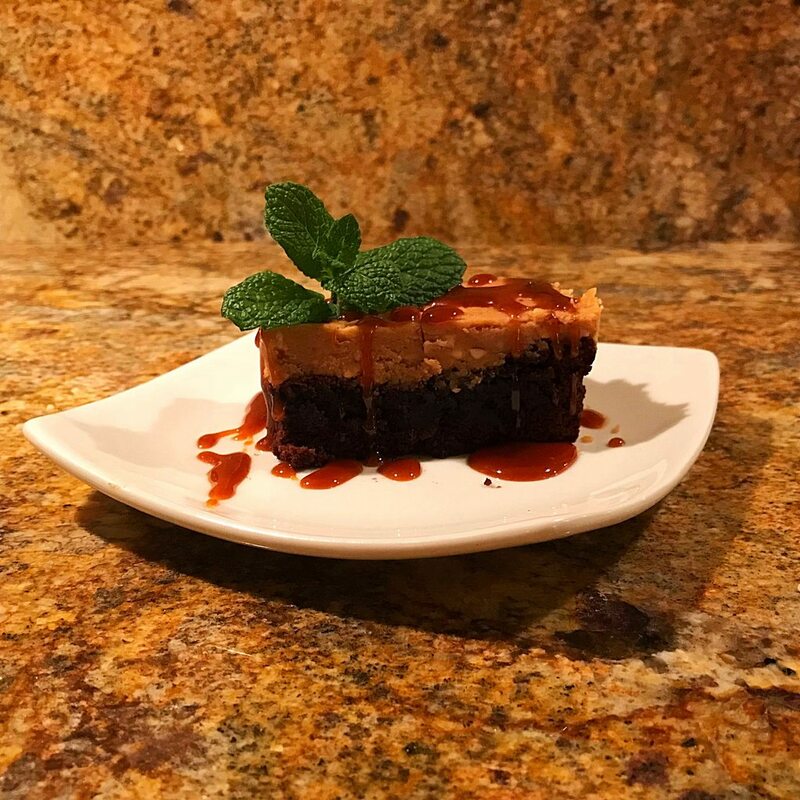 Mrs. P made chocolate fudge brownies, with a peanut butter buttercream layer, with homegrown mint, and caramel sauce for her 60?!? birthday. Wow! Where did the years go? We all know that 60 is the current 40. Wait - aren't you supposed to be cooking for her birthday?!?! I'll believe Mrs. P is 60 when I believe the world is flat. I don't want to bring this to me on or around Mrs. P's Day. But people always ask me whether I cook for the women I go out with. And the answer is: no, I want them to keep going out with me. I always cooked for women I dated - hence my seven divorces. My shabbat roast chicken was the first (and clinching) dinner I ever made for Significant Eater. It was also the last shabbat dinner I've made. You mean like your mission was accomplished? N made an apple whiskey cake for my birthday. (I'm saving the full-on chocolate chocolate cake recipe for when the big 5-0 hits.) It's very adaptable regarding types of apple and liquor; for the latter, you can use whiskey (as N did--we have Glenlivet), bourbon, or brandy. 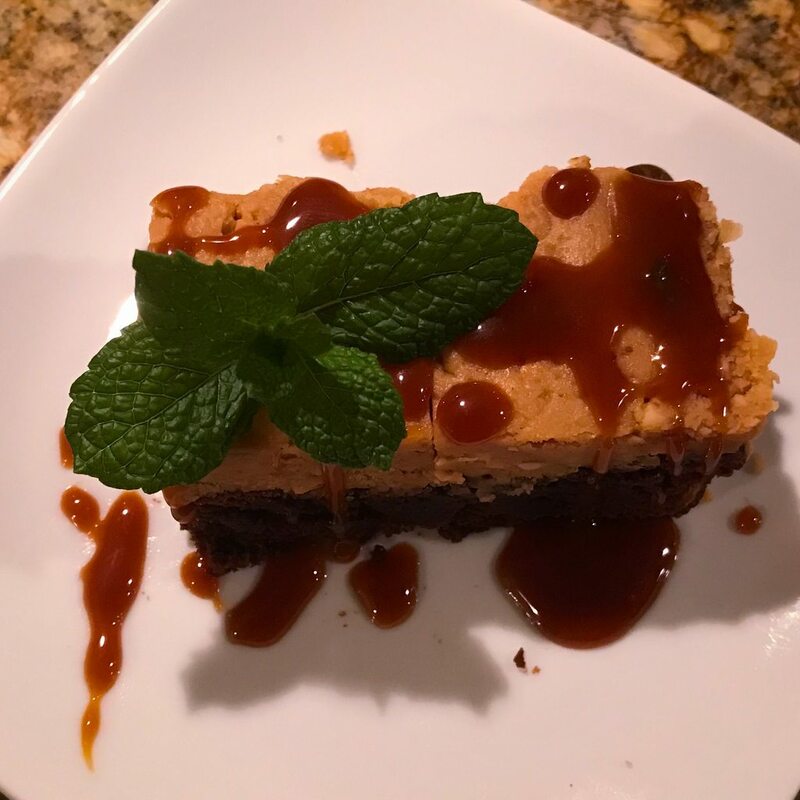 On its own, it's fairly basic--more of a coffee cake than a "birthday" cake--but last night I whipped heavy cream with a bit of sugar, some cider syrup, and a 1/2 capful of white rum. I don't know if it is because word got out I like to cook, or if this fall was a particular windfall year, but I am getting baskets of fruit from friends and neighbours. Anyway, I now have about 3kg of quince paste which I think would make good host gifts, and I made a nice apple cake last Sunday with three gorgeous and VERY LARGE boskop apples. N made Dorie Greenspan's recipe for cranberry-lemon Eton Mess that was published in the NY Times Magazine a few weeks ago. It's really good and the tart-sweet balance is just right. Definitely a good one to make while cranberries are still readily available (I got fresh ones at TJ's).